Monster Energy Dixon Racing Team Kawasaki flew out to Leon, Mexico for the second year in a row and the penultimate round of the 2015 FIM Motocross World Championship. On a rough and weather-hit circuit and in damp but humid conditions Max Anstie guided his KX250F to fifth position overall by finishing 2nd and 11th in the two motos. Round seventeen of eighteen took residence in the Parque Metropolitano and around a level, jumpy and fast course among bushes and cacti. The climate had been unstable in the build-up to the Grand Prix and heavy rains and storms had created a soft and tacky terrain on Saturday before belated sunshine began an authentic drying effect. Max suffered from a poor start in the Qualification Heat but recovered well to secure a top five classification in the sparse gate for Sunday’s motos. Raceday dawned wet again. The nighttime showers had turned the track into heavy and clay-like slop. Finding the drier and faster spots were key to good pace but also required a careful throttle hand so as to not lose control. Many riders fell in a difficult first moto as the blue skies returned and the temperatures again climbed. Anstie was into second place on the opening lap and although he tried to pursue Pole-sitter Pauls Jonass he rode largely alone to confirm the runner-up slot. In a bright second moto and on a surface with more choice in terms of lines and passing opportunities Anstie was immediately dealt a handicap when he crashed on the first lap. Recovering the Kawasaki the front brake lever had been pushed under the bars. He tried to recover ground and positions but looked out of sorts and could not make satisfactory progress through the rankings. Eleventh place meant fifth overall. 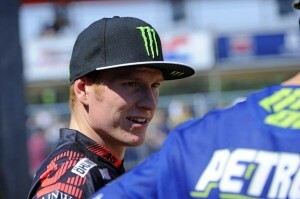 Pauls Jonass’ comeback with a vastly damaged machine knocked ‘99’ out of fourth. Still third in the MX2 FIM World Championship standings Max is now looking good for a top three finish in the 2015 campaign – one in which he has claimed three victories and five podiums – and is 31 points ahead of Valentin Guillod. He is 32 behind Jonass. Fifty points remain to be won at the final fixture of the year at Glen Helen and the Monster Energy U.S. Grand Prix next week; site of Anstie’s first world championship appearance five years ago.